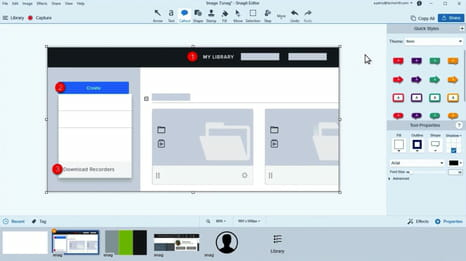 Snagit is an advanced screenshot capturing software that allows you to take and edit images of what's going on on your computer screen. It also allows you to capture video of your on-screen actions. Using Snagit, you can also capture your entire desktop, a portion of the screen, a given window, or create a scrolling screenshot for images that require more than a one-page display. The software, then, allows you to edit these captures to create high quality and custom graphics. Finally, Snagit makes it easy to share your captures by allowing you to create a shortened link to send to others or to use to place into your presentations. Latest update on April 15, 2018 at 10:57 AM.